I have made this recipe three times since Thursday (it is now Tuesday)...so three times in less than a week. It is out of Deb Perelman's cookbook The Smitten Kitchen Cookbook. She is the owner/author of one of my favorite cooking blogs, Smitten Kitchen. It is an absolutely fabulous cookbook - I have only had it a week and have made three different recipes from it (and we were out of town for half of the week). I altered it just slightly by substituting honey for molasses and adding a tad more cinnamon. We were out of molasses when I had the urge to make it. I love it so much with the honey - I don't know how it could get much better, but Deb is almost never wrong, so I say give it a try both ways. Preheat oven to 400 degrees. Run the eggs in a mini food processor until smooth and pale in color (about the color of buttermilk). Add remaining ingredients except butter and powdered sugar. Process until smooth. Melt butter over high heat in a 9 inch ovenproof skillet (cast iron works well). Swirl the butter up onto the edges of the skillet as well (because it is going to puff up a bit). Pour the batter into the prepared skillet and bake in oven for 15 to 20 minutes. Slide the dutch baby onto a plate and serve with powdered sugar and fresh fruit. I like to put my powdered sugar into a wire colander and shake a bit to get the dutch baby lightly coated in powdered sugar. I serve fresh fruit (usually blackberries and/or blueberries and raspberries) on the side. Eliana approved! 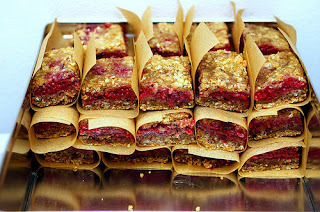 They are almost like homemade Nutri-Grain Bars, but sooooo much better! 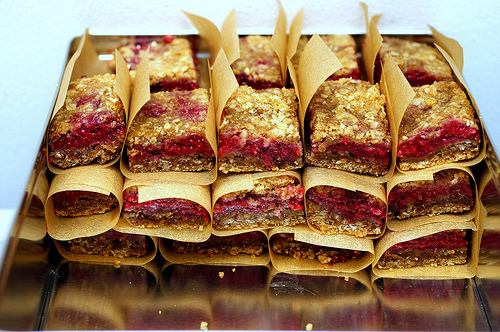 I have made them with blueberries and blackberries as well - all are equally good, but raspberries are my favorite!